The internal spaces of toys are made up of cotton, plastic, and air. 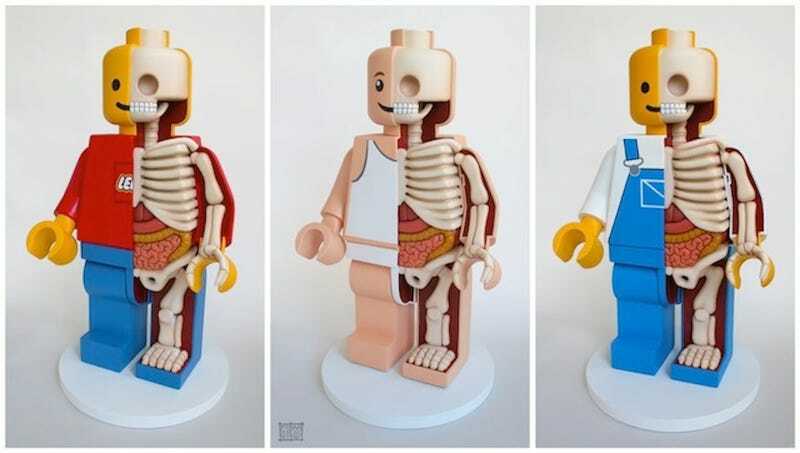 But these amazing sculptures reveal an entire re-imagined internal anatomy for our favorite toys — ranging from Lego man, to My Little Pony, to Barbie — complete with bones, detailed musculature, and internal organs. The sculptures are the work of Jason Freeny, who molds them out of clay, then finishes them off with a mix of primers and acrylics. If the toy he's working on has some basis on a real-life animal, he'll sometimes also base his model of that animal's real-life anatomy. For a lot of the sculptures, though, the inspiration comes from much closer to home: people. Dissection reveals the insides of Sulley from Monsters Inc.
Jason told io9, "Usually I just let the shape of the toy dictate it's inner anatomy shape. Sometimes I will research the specific animal it is based on, although mostly it is a morphed human anatomy seeing as most characters stand upright."